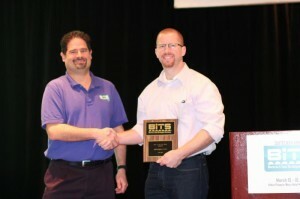 Don Thompson, Director of Engineering at R&D Altanova, was awarded the Best Presentation Award at the 2015 Burn-in & Test Strategies Workshop. This is Don’s second straight year receiving the award, the first time a presenter has won in back-to-back years (2014 & 2015) in BITS 16 year history. The presentation topic focused on 80 GHz sockets for automotive radar. “Among other high frequency applications, automotive radar is an area where we see great opportunities for our Invisipin product in the coming years, ” said James Russell, CEO of R&D Altanova. You can find this presentation by accessing our White Papers & Presentations.